Let’s face it. 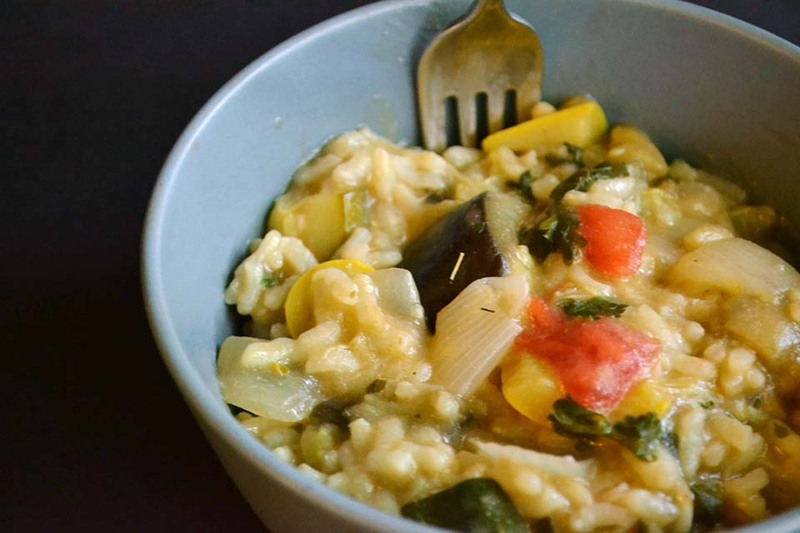 Risotto is pretty stinkin’ awesome. 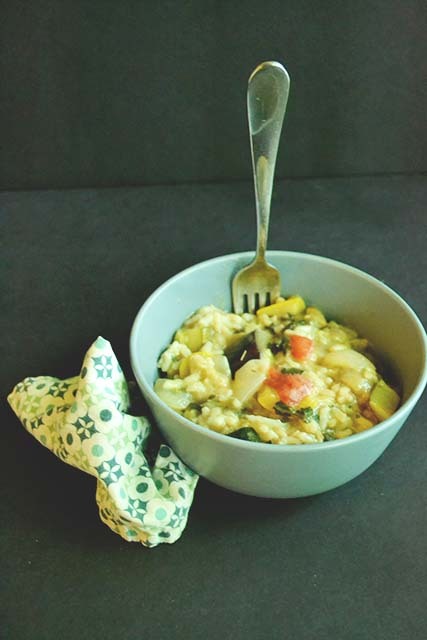 Why I really love risotto, though, is for its versatility. It handles just about any vegetable or spice you throw at it with grace and confidence. A few weeks back we picked up our Wednesday CSA box, and then I went out of town for the weekend. When I got back on Monday I was greeted by the fridge full of vegetables, and the looming promise of another CSA box in a couple of days. 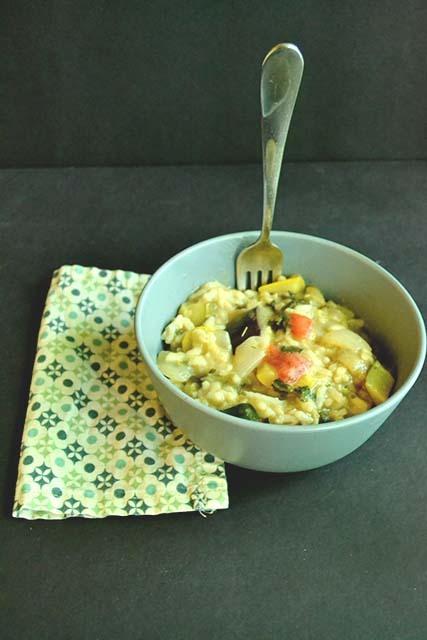 I knew I needed to gather forces and use as many vegetables as possible, and my first thought (after vegetable soup which was so.not.happening with it being so warm) was risotto. 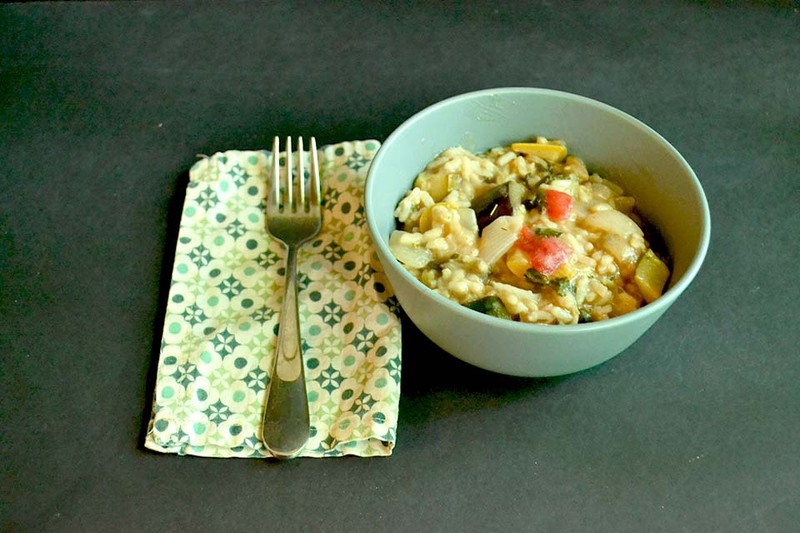 The rice in risotto is Arboria rice. This is a special kind of short grain rice. It’s known for being firm and creamy. It also blends well with just about any flavor you throw at it. I especially enjoy it for it’s creamy consistency – since a dairy-free-world is often a creamy-consistency-free-world. This type of rice should be available at most grocery stores – although the store I frequent didn’t carry it. 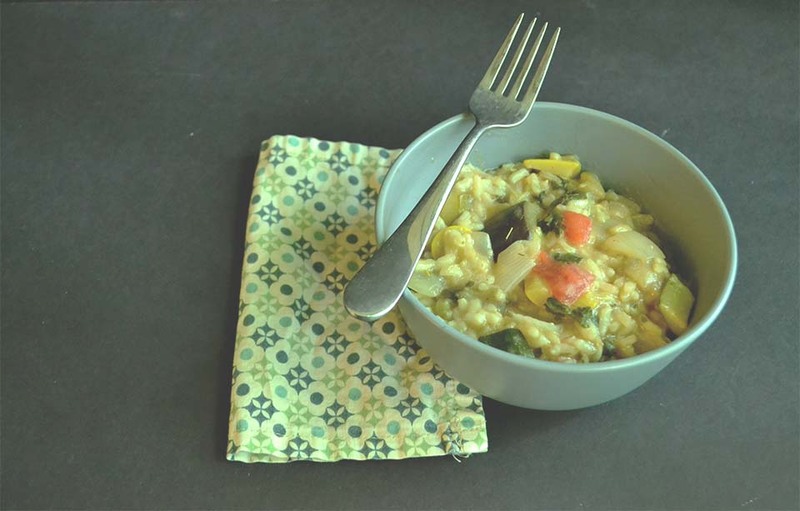 Any other type of rice won’t make ‘risotto’ in this recipe. You ready to make some summer-time-in-a-bowl? Using the saute feature, heat the Instant Pot with a bit of oil or vegetable broth. Add the onion, garlic 3 minutes or until just starting to brown. Add the squash/zucchini/eggplant and stir well until starting to soften. Add the rice, and stir well. Add the vegetable broth, wine, salt, black pepper, and oregano and stir well. Close the lid and put the pressure valve to "sealed"
Store any leftovers in an airtight container, once cooled completely. Add the onions, garlic, stir to soften. They won’t brown, but they’ll get slightly soft. Transfer into a serving bowl and stir in: parsley and nutritional yeast, earth balance (optional) and tomatoes. Stir well. It will thicken after a few minutes. If the entire batch will not fit in your rice cooker (will depend on capacity) the zucchini, eggplant, squash amount can be reduced. Silly question, (I’m new to the Insta pot) is the 1.5 cups of cooked or uncooked rice? Uncooked! 😀 Not a silly question at all! I often wonder the same thing when reading other recipes! Is the wine absolutely necessary? I don’t have any. Could I just use an extra half cup of veg stock instead? I wonder if it would affect anything. Thanks. You can just use the extra half cup of veg stock. The wine gives it a small flavor change, but it isn’t completely necessary.